The security requirements for public facilities are growing rapidly. This is especially true of prominent football stadiums, such as the Allianz Arena in Munich. High visitor numbers, worldwide media presence, but also stringent requirements for structural security require particularly effective, holistic perimeter protection concepts. 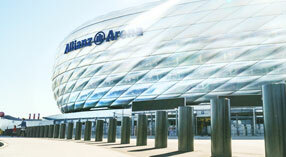 The Allianz Arena offers a total of 75,000 seats at Bundesliga games. The outer protection of a stadium must be designed in such a way as to ensure a preventive securing, regulating and controlling of huge passenger and vehicle flows in and around the stadium. Among others, this is to avoid panic, turmoil or overfilling in the stadium and to ensure a quick and smooth evacuation, e.g. in case of fire. But threats are changing. Especially the ever more aggressive terrorism and attacks on people gathering with violently invading vehicles forming an additional central risk factor. 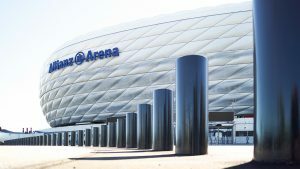 Therefore, in April this year, the Perimeter Protection Germany GmbH, the German subsidiary of the global acting Perimeter Protection Group (PPG) was commissioned by the Allianz Arena to implement the perimeter protection concept of the stadium. The aim was to secure the north and south side of the property effectively against terrorist attacks with vehicles such as trucks. The west and east sides are protected by a highway and buildings from such attacks. The whole project should be realized by the end of July. PPG has a good reputation due to former High Security projects, for example the Jewish Community in the centre of Munich. Together with the well-known Munich engineering office BPR Dr. Ing. Schäpertöns Consult GmbH & Co. KG, PPG implemented the solution consisting of a mix of 70 fixed and movable M30 crash bollards, which the company manufactures in Germany. The bollard systems certified as per international standards PAS 68, ASTM and IWA 14-1 stop vehicles with different impact velocities, according to their classification. Depending on the security requirements, Perimeter Protection Group offers different movable or fixed crash bollards. Pedestrians may enter unhindered but vehicle traffic is to be stopped. They come along with fast operating times and shallow foundations. Ready-to-install bollard units with separate control box allow quick and easy installation in all climate zones. Our crash bollards offer reliable operation and are of course low maintenance. When lowered, these can be easily driven over as per bridge class SLW 60, without hindering the operational necessary vehicle traffic, e.g. for service work. Nevertheless, they effectively block areas with longer access routes, even against heavy vehicles such as trucks, by lifting out of the ground in seconds in case of emergency.